California Near Space Project (CNSP) is pleased to announce the launch of our latest project, Super Pressure Evolution Efficiency Design, “SPEED.” The primary goal of the SPEED Project is to design and build successful Super Pressure Balloons. The evolution of efficiency and design with a Super Pressure Balloon requires extensive testing of candidate films including, tensile strength, film weight, gas permeation, seaming techniques, solar heating and geometric design. 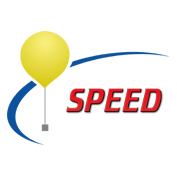 The project leader of SPEED is Lee Meadows; he has designed and built several custom Super Pressure Balloons. Most recently, flight # CNSP-21 and CNSP-24 that flew around the world. CNSP will continue to refine the techniques used in our SPEED Project to push the evolution of efficiency and design in the Super Pressure Balloons we build.